Numidia is a region in North Africa, covering the area between Mauretania Tingitana and Africa Proconsularis. It therefore includes the territory which was at other times called Mauretania Caesarensis. 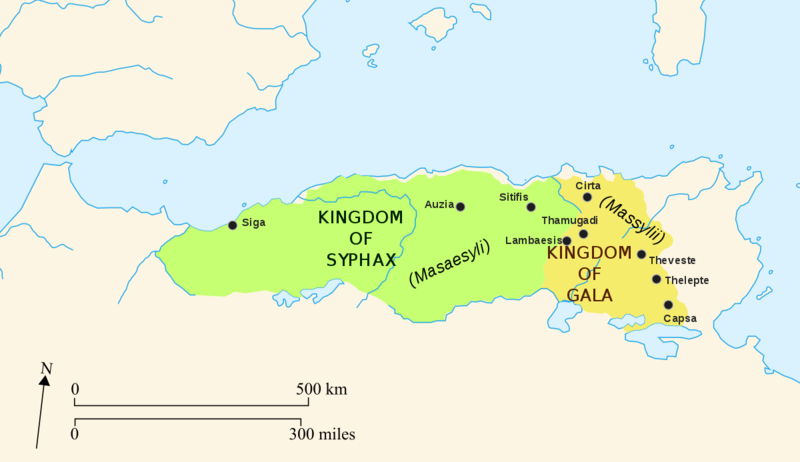 Numidia as the other African provinces became highly Romanized and was studded with numerous towns. The chief towns of Roman Numidia were: in the north Cirta, its port Russicada, and Hippo Regius. To the south lay Theveste and Lambaesis. Lambaesis was the seat of the Legio III Augusta, and the most important strategic centre. It commanded the passes of the Aurès Mountains (Mons Aurasius), a mountain block that separated Numidia from the Gaetuli Berber tribes of the desert, and which was gradually occupied in its whole extent by the Romans under the Empire. Obverse: Laureate bearded head left - king Micipsa ?